We love fish and seafood, and salmon is one of our family's favourites. Raw or smoked, it's always a welcome treat in the lunch box, in salads and in our mains. And I was just too happy to oblige to receive an invitation to the #huonsalmon blogger's competition sponsored by Huon Aquaculture. With salmon and my cooking style, I prefer simple and fresh. As much as possible, I want the star of the dish to shine. So it was a little bit difficult to think of a dish to make that's not already out there. And this came to mind - Australian salmon meets Asian spring rolls. This may be one too many of similar dishes out there, but I don't mind. This was a welcome change to our usual fare. I also added some Australian macadamias for that extra texture and to make it even more Aussie. In a bowl, soak the rice noodles in warm water for 10 minutes. Once soft and noodles have turned white, drain. In a large bowl, combine the rice noodles, julienned cucumber, carrots and the macadamias. Prepare a wide bowl with some water, and a dry tea towel on the counter. Soak one rice paper roll in the water for 10 seconds or more until soft. Place the rice paper and pat on the tea towel, then on a cutting board. 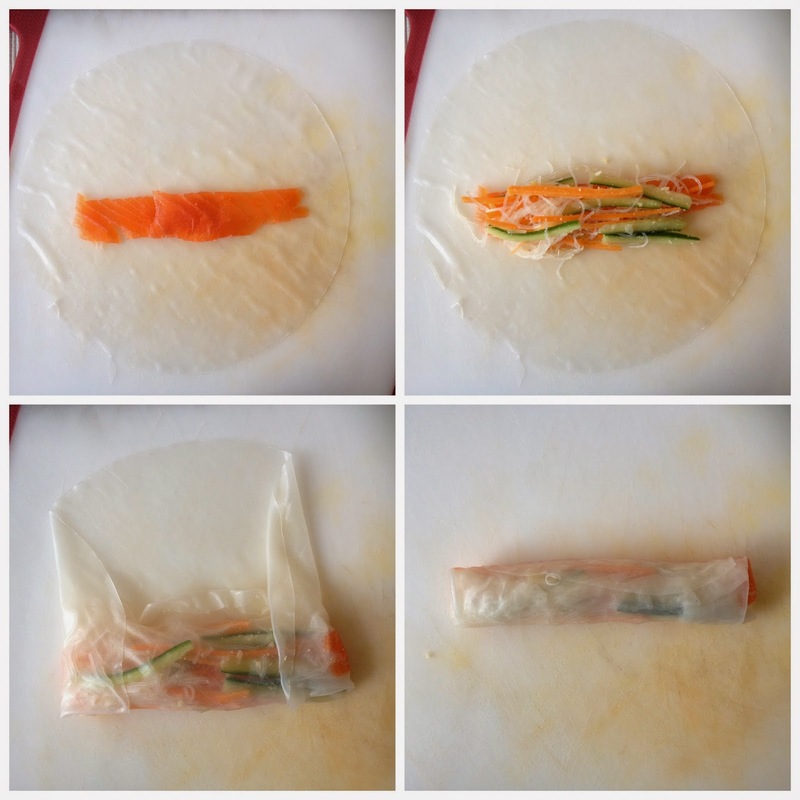 Place a strip (or more) of smoked salmon on the rice paper roll. Spoon some of the rice noodle-macadamias-cucumber-carrts onto the smoked salmon. Fold the front end of the rice paper roll and slightly tuck to hug the filling, fold the right and left sides then continue to roll. Continue with the rest of the rice paper rolls and the filling until you've used up all ingredients. These can be dipped in simple soy-sauce or sweet chilli sauce, or you can also make your own Nuoc Cham sauce which is the traditional dipping sauce for the inspiration for this dish - the Vietnamese spring rolls. This sauce is adapted from SBS Food with some slight changes. Grind the garlic and chillies in your mortar until you get a paste consistency. Combine the fish sauce, water, sugar in a bowl stirring until the sugar is dissolved. Add the Worcestire sauce and stir. Add the garlic-chilli paste, stir and serve with your spring rolls.